“Isolation, solitude, secret planning,” Don DeLillo once prescribed. “A novel is a secret that a writer may keep for years before he lets it out of his room.” DeLillo’s description of his plot for Great Jones Street strikes a similar note: “a man in a small room, a man who has shut himself away, and this is something that happens in my work — the man hiding from acts of violence or planning acts of violence, or the individual reduced to silence by the forces around him.” Mao II, Libra, even DeLillo’s misunderstood football novel, End Zone, include characters who have receded from the world to be reborn. Some might call that paranoia. When the public world fails to reveal its meanings to us, we retreat into our private rooms, our private minds, where there are infinite schemas and explanations. We are the only skeptics of our own souls. A secret is only as good as its ability to be exclusive, and yet a conspiracy theory is only as good as its ability to be inclusive. Whereas his contemporary Thomas Pynchon might share these sentiments, Pynchon has chosen to be a jester, while DeLillo has a deadly serious endgame. Years ago, a Jesuit told me that he had the same journalism professor as DeLillo when he studied at Fordham. The professor showed the Jesuit one of DeLillo’s term papers. I never asked about the paper’s content or style; it felt like I had been given a slice of a secret, and that was enough. It turned out to have been an open secret: the professor, Edward A. Walsh, had kept the paper to show budding writers. Yet the tension of a secret that somehow can also be easily found captures the DeLillo mystique. He writes but he does not teach. He gives interviews, but they are clipped and often vague. He lives in the city but seems to somehow live outside of it. He is not hiding, but he is certainly not trying to be found. Zero K, DeLillo’s newest novel, is like one of those open secrets. To say that it is not groundbreaking would be to misread the purpose and progression of his canon. The major constellations of DeLillo’s work are White Noise and Underworld; the former for its ability to capture his culture’s paranoid moment, and the latter for a son of the Bronx to finally, and fully, examine the place of his birth and youth. Zero K is an extension of DeLillo’s developing themes, but it places a darker color upon them. Billionaire Ross Lockhart, his second wife, Artis, and his son Jeff are the three central characters of the novel. Ross says “everybody wants to own the end of the world.” It soon becomes clear that he means the end of our own world, but for a man like Ross, the end of the self is the end of the universe. Artis, much younger than Ross, is terminally ill. Ross has been financing a mysterious project that includes “cryonic suspension,” something he admits is not a new idea, but one “that is now approaching full realization.” The project is called The Convergence. Reading DeLillo without understanding the themes and concerns of a Jesuit education is like walking onto a basketball court thinking you can run the ball without dribbling. DeLillo joked that he slept through Cardinal Hayes High School, and that the Fordham Jesuits taught him how to be a “failed ascetic.” This is exactly the type of thing an Italian-American from the Bronx would say (I would know). One of DeLillo’s running influences has been Jesuit paleontologist Teilhard de Chardin, whose concept of the Omega Point posits that the universe is evolving toward an ultimate convergence of systems, a perfect consciousness. DeLillo examined the concept in End Zone through the obsessions of narrator Gary Harkness. As Stephen J. Burn notes, DeLillo returned to Teilhard’s writings for Ratner’s Star, and even considered titling four other novels Point Omega (the inversion means the same) — Mao II, Underworld, The Body Artist and Cosmopolis — before using the title for his short 2010 novel. This is not to say that Zero K is a Jesuit or Catholic book. 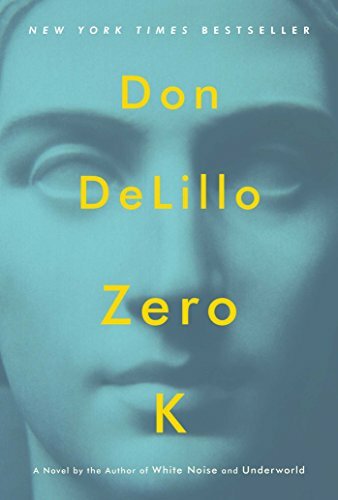 Zero K might be DeLillo’s most agnostic novel, a work that takes Teilhard’s superstructure and strips it of God and Christ and other signifiers. If anyone portends to be God in Zero K, it is Ross, or the mysterious Stenmark Twins, whose philosophies about war, death, and the afterlife put flesh on the skeleton of the Convergence. If Ross needs men like the Stenmark Twins to offer a narrative to his cryonic project, he needs his son to bear witness. Jeff soon realizes that Ross wants him to be there with him when Artis dies. It is a strange tinge of vulnerability for a man who left Jeff and his mother when Jeff was 13: “I was doing my trigonometry homework when he told me.” Jeff has never quite forgiven him, but is able to keep both his mother, Madeline, and Artis in high esteem. The facility is full of screens that lower from the ceiling and play silent images of destruction and suffering. This is another of DeLillo’s trends: the screen as projection for the man in his small room. Players opens with a screen: the showing of an on-flight film, which includes golfers attacked by terrorists. A 24-hour gallery repeat of Psycho opens Point Omega. Then there is the metaphorical screen of End Zone, the canvas blinds that are wrapped around the Logos College practice field so that Coach Creed can hide his players. The same method that slowed the first half of the book gives a surreal quality to its second half. As Jeff describes it, the Convergence facility exists outside of time, “time compressed, time drawn tight, overlapping time, dayless, nightless, many doors, no windows.” I have always thought DeLillo is at his most masterful when he starts changing our atmosphere, when he puts us in the “dense environmental texture” of the supermarket in White Noise. It usually happens halfway through is novels, and Zero K is no exception. At the midway point we realize that Ross has a deeper plan for the Convergence and his son, and its drama pushes the book toward its conclusion. Sadness might seem too sincere an emotion to ascribe to a novel written by a postmodernist, but Zero K pushes its readers to feel. It is almost impossible to not. With its confluence of screens, strange artwork, empty rooms, long hallways, and shaved hands of those soon to be frozen, Zero K creates an experiment, and we, its subjects, feel pulled to interact. A man in a small room, obsessed with the present and yet somehow existing outside the scope of time: this is DeLillo’s concern. “Isolation is not a drawback to those who understand that isolation is the point,” one character says in Zero K. DeLillo’s new novel, particularly its end, is a slight pivot for the novelist. Yet when a writer is able to capture so many of our anxieties on his pages, a pivot can be profound. Nobody was a more astute chronicler of the post-war crisis of the female mind in America than Shirley Jackson. This review is completely insincere and disengenuous. I read this book last night and it is awful. The Millions is posting a positive review simply to have something full of advertising links leading to Amazon buy now buttons. You could cut and paste that comment on pretty much any review on this site, or really almost anywhere on lit-culture sites all over the web, without altering its use-value in any substantive way. I’d cautiously ask: do you have anything specific to say about the failings of the novel or the review? I second Mr. Reynolds. Always up for more of Mr. Ripatrazone’s writing. His love of English, elegant prose, and careful analysis cut through the fog, regardless of the topic. I ordered Zero K (along with Jenny Diski’s In Gratitude) at my local book shop (the wonderful St. George’s, of Berlin) this afternoon… quite excited about this! Ulysses is the literary equivalent of Angkor Wat or Machu Picchu or any of the world’s other great, beautiful, challenging locations. Just as there are guides, travelogues and travel television shows designed to communicate a flavor of those locations while providing the traveler with the tools needed to actually visit them, there are guides and books hoping to create readers of Ulysses while providing those readers with the tools needed to actually read and appreciate it. There are Gifford’s Annotated Ulysses, Blamire’s New Bloomsday Book, Kiberd’s Ulysses and Us, and many more guides, skeleton keys, and potential philosophical structures. The House moves episode by episode through Ulysses with “the Cicerone” presenting the plot, historical context, and some of the many subtle threads of details that weave through the work, with “Passageways” sections in which the speakers discuss the episodes. Though “discuss” might not be the right term as the speakers rarely directly respond to each other. Instead, they pile observations, critical insights, questions, philosophical flights of fancy, non-sequitorial conclusions, and bombast into a babbling tower of interpretation. At times the “discussion” is almost a vaudeville act; one could imagine the speakers participating in the intellectual equivalent of the exchanging of hats from Waiting for Godot. The obvious question raised by a book like this is: “What if you haven’t read Ulysses?” What if you don’t know about the dairymaid, the ad for the House of Keyes, or Throwaway the winner of the Gold Cup horse race? Unfortunately, House does not have enough content independent of Ulysses to be read and enjoyed by someone who hasn’t read Ulysses. It has speakers, but no characters, and statements, but no plot. Its jokes are all inside jokes. For his part, Rios seems perfectly comfortable with writing to this particular audience, focusing his prose more on the critical than on the narrative components of his novel. Ultimately, this means that House of Ulysses should be approached as criticism even if it uses techniques of fiction to convey its ideas. Ulysses is a dramatic expression of the relationship between life and literature through ambitious experiments in narrative style and method. So it makes sense for criticism about Ulysses to experiment with styles of interpretation. Doing so allows the critic to explore and celebrate multiple levels of Ulysses within the same act of interpretation; elucidating details, making connections, and describing themes, while experimenting with the nature of communicating interpretation and thus directly engaging Ulysses’ statements on the nature of style. I was left with one dominant effect from reading The House of Ulysses; the desire to read Ulysses again. There are readers who have decided they will simply not read Ulysses, and no one will convince them. There are readers who haven’t ruled it out, but Rios won’t convince them. There are those who have it on the list, and when they get to it, Rios and his House will be there to deepen their reading. But the readers who will get the most out of the novel are those whose familiarity with Ulysses will allow them to appreciate Rios’s criticism. Criticism has a number of different goals, and one of them is to motivate a reader to return to the source text with new eyes. In terms of this goal alone, The House of Ulysses is a brilliant work of criticism, one that reveals without dictating, written in the spirit of the source work, with a sense of humor and a profound love of literature.